Google continues to bring new features to improve its users’ privacy. In this episode Google has now launched a new feature for its email service ie Gmail. With this feature launched in the name of Confidential Mode, users can protect the e-mail they send from ‘passcode’. The most striking feature of this feature is that with the help of this, the unauthorized use of email will be prevented. Confidential mode generates a passcode through Google before the email is sent. This new Gmail feature can be used on computers and laptops as well as on Android and iPhone. 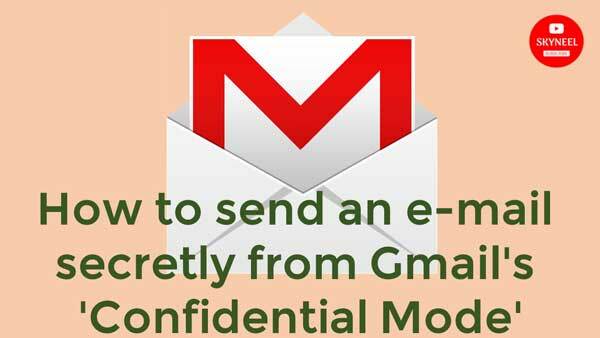 Let’s know how to send an e-mail secretly from Gmail’s ‘Confidential Mode’. 1. Firstly open www.gmail.com in your computer or laptop. 2. Now enter your username and password and enter Gmail login. 3. After you login to Gmail, you will have to click the compose button. compose button will be on the top left on the computer or laptop. 4. After entering the compose email, enter the email address of the person whom you want to send an email and type in your message. 5. After the message is typed you will see a clock icon on the right next to the sand button below. 6. Click the clock icon in the computer and select ‘Confirm by Passcode’ option. 7. After this, select the expiration time of the message. 8. Now you have to enter the receipt number of the receipt, which you want to send confirmation message. 9. When the recipient receives an email, he has to enter the passcode that he has received through the message. 10. This will unlock the message. 11. Users can also encrypt their message by selecting ‘No SMS Passcode’ option. 1. First of all you open the Gmail app. 2. In Gmail, you will find the compose in the bottom right. The ‘+’ icon for compose email is given. 3. After entering the compose email, enter the email address of the person whom you want to send the email and type in your message. 4. In the Gmail App, you will get Confidential Mode option when you tap the three dot on the top right. 5. Now you have to go to Confidential mode and change the settings and save it. 6. After this, select the expiration time of the message. 7. Now you have to enter the receipt mobile number which you want to send confirmation message. 8. After this, the receipt will receive an email in which passcode must be entered which it has received from the message. 9. With this, the message will be unlocked. 10. Users can also encrypt their message by selecting ‘No SMS Passcode’ option. Please note that emails sent through Confidential mode can not be printed, copied, downloaded or forwarded. In this article we have told you about send an e-mail secretly from Gmail’s ‘Confidential Mode’. If you liked this article then you can also like our Facebook page and subscribe to our YouTube channel too. If you have any problem related to this article, you can comment and tell us.